Eye Dull Musings: Like Jelly Beans? In the software group where I work we often try to play some sort of prank on someone when they go away on vacation. It usually involves some sort of decorative addition (or subtraction) to their office. So, I was a bit surprised when I returned after a week-long vacation and didn't see anything out of the ordinary in my office. Even my comfy chair was still at my desk - no one had swiped it. I initially figured people must have been busy last week and didn't have time for any sort of pranks. But, once I tried to start working, it didn't take long to discover what had been done. I initially couldn't log onto the computer network from my PC. I verified the network cabling hadn't been tampered with, but still I kept getting a logon failure message. I eventually talked to someone from the IT help desk and he reset my password for me - just in case I might have forgotten it while I was away for the week. Still no luck - I couldn't log in. So, the help desk guy came over to my desk to try to help. He then tried to log onto my PC as "administrator", but it kept appearing as "admunustrator". He looked carefully at the keyboard to verify he was hitting the right key, but whenever 'i' was hit, a 'u' would appear. Hmmmm.... I then realized what was wrong. It turns out someone had swapped the keycaps of the keys in the middle of my keyboard. 'i' and 'u' were swapped, along with 'g' and 'h' and 'c' and 'v'. It was very subtle and hard to notice from just looking at the keyboard. Since I'm not a touch typist, (I tend to glance at the keyboard every so often as I type), I was making the minor adjustment to hit a misplaced key when entering my password. 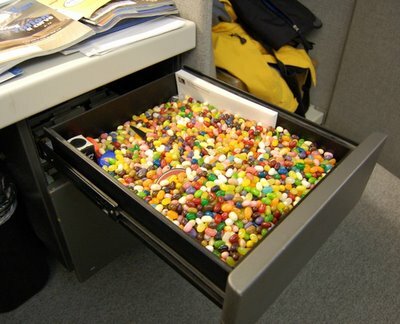 The whole drawer was filled to the top with Jelly Belly jelly beans. That's a lot of jelly beans. I can now get very funny reactions from people when I ask if they want a jelly bean and open the desk drawer and show them the huge pile inside. The initial reaction is usually an exclamation like, "Whoa! You're crazy!"